Abraham Lincoln – Where is Ruthi? Riding the circuit was a common practice for judges and lawyers in the 19th century. As communities began popping up in sparsely populated areas, judges and lawyers would travel from county to county to hold court sessions. Abraham Lincoln, based in Springfield, Illinois, rode the 8th Judicial Circuit for three months twice a year. Weather often made travel difficult. Lincoln would stay with friends or sometimes a tavern. Taverns during Lincoln’s time were a type of inexpensive hotel, often dirty and seedy; not like the taverns of today. Pittsfield, Illinois, the county seat for Pike County, was a regular stop for Abraham Lincoln when he was a lawyer riding the circuit. I’m sure Lincoln enjoyed his time in Pittsfield. He had close friendships with several of Pittsfield’s citizens; three would later move to Washington D.C. to work with President Lincoln in the White House. The charming community has a rich heritage of Lincoln connections and a unique way to share it. Pittsfield’s Talking House Tour is fun, entertaining, and amusing. The tour begins at the Pittsfield Visitor Center where you pick up a driving tour map. Then the fun begins! Continue driving your car from house to house, stopping at each one and tuning the car radio to the FM station indicated on the map. Through the car’s speakers, an occupant of the house from Lincoln’s time tells stories of their relationship with the circuit-riding lawyer. For example, at the Scanland House, Mrs. Scanland tells about an occasion when her turkey dinner got cold because Abe and her husband, Mayor Scanlan, were at the local drug store telling tales and chewing the fat. It’s wonderful to look at a house where Lincoln was often a guest and listen to stories about him. It’s not hard to imagine that the year is 1852 and Abraham Lincoln is in town for the twice-a-year court session. If Lincoln is in town, most likely he can be found in the William Watson Hotel lobby gabbing, discussing politics, and chatting it up with the locals. Although he usually stayed in friend’s homes, Abe would often pop in to the William Watson for a visit with Pittsfield’s citizens. Since it is still a wonderfully delightful boutique hotel, I took the opportunity to stay in the “Lincoln Suite” overnight. The experience was simply lovely. 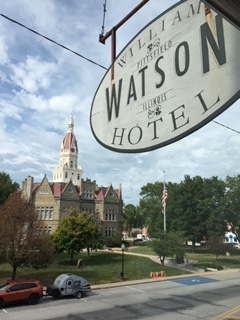 If you are ever in Pittsfield, Illinois, (which I recommend you make a point to go) I encourage you to stay at the William Watson Hotel. 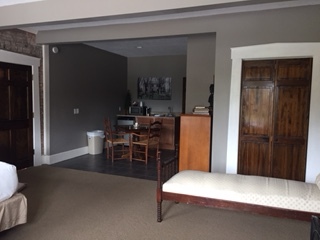 The attention to detail, terrific service from the staff, a coffee shop right next door, and affordable rates makes for a great place to rest your head for the night. And don’t forget: Abraham Lincoln hung out here! Lucky me! 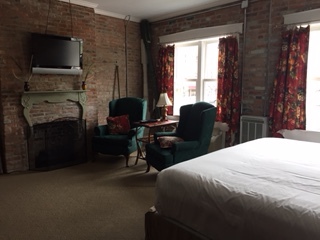 I stayed in the beautiful Lincoln Suite at the charming and comfortable William Watson Hotel! I found Abraham Lincoln on the Illinois College campus in Jacksonville, Illinois. It was simple to locate the national park passport cancellation stamp in Tanner Hall. However, it took some research to dig up the connection between the first university in Illinois and the 16th president of the United States. Abraham did not attend Illinois College. In fact, he didn’t attend any school. As a child he taught himself to read with less than a year of formal schooling. So why did I find him at Illinois College? About the same time that Illinois College was conducting its first classes in 1830, a young adult Abe arrived in New Salem, about 30 miles from the school. Lincoln developed close friendships with six of the Illinois College students including David Rutledge. David had a sister, Ann, who fell in love and became engaged to young Abe. Abe was set up to attend IC when Ann suddenly and sadly died from typhoid fever. Devastated, Lincoln slipped into a dark suicidal depression. By the time he emerged, the opportunity to attend a formal school was gone. Another important friendship from Illinois College included Richard Yates. Yates was equivalent to Abe’s campaign manager when Lincoln ran for president of the United States and later Yates became governor of Illinois during the Civil War. Yates was invaluable as a political ally and advisor to Abraham Lincoln. Perhaps the closest friendship with an Illinois College alumni was his relationship with William Herndon. 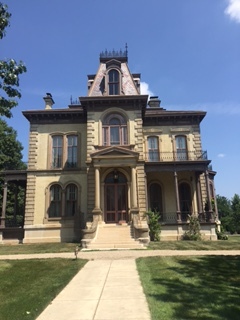 Although Abraham did not know Herndon during Herndon’s years at IC, they became colleagues and partners in a law office in Springfield, Illinois. They remained partners until Lincoln left for the White House in 1861. Illinois College is on a lovely, landscaped campus. The private liberal arts university is a perfect setting to contemplate what would the U.S. be like if Abe had married Ann and received the education he so desired. Would he have become president of the United States and Ann the First Lady instead of Mary? I like to think so. Surely it was destiny. Looking for Lincoln in Alton, Illinois is a bit of a search. There are two places to obtain the Abraham Lincoln National Heritage Area cancellation stamp: the Alton Visitor Center and the Alton Genealogy Library. The stamps are identical. As the name indicates the Visitor Center is a visitor center. They sell t-shirts and coffee mugs, have loads of brochures for local attractions, and offer information on the area. The Genealogy Library is a beautiful building in downtown Alton where folks research their ancestry. But I’m searching for Abe. I found Lincoln at Lincoln-Douglas Square, the site of the 7th and final debate between Abraham Lincoln and Stephen Douglas on October 15, 1858. Douglas was Lincoln’s arch-nemesis. Douglas was the incumbent Democratic senator and he was running against Republican candidate Abraham Lincoln. Their series of seven debates centered on the issue of slavery. Douglas was the instigator of the Kansas- Nebraska Act of 1854 which repealed the Missouri Compromise of 1820. The Missouri Compromise was an act intended to retain a balance between free and slave states. Basically, if a slave state (like Missouri) is admitted into the union then a free state (like Maine) must also be admitted. And all territories above the Louisiana Purchase would be free. The Kansas-Nebraska Act allowed the new state to decide for itself if it wants to be free or slave. In Alton, Illinois, Douglas attacked Lincoln’s House Divided Speech. You know: “A house divided against itself cannot stand.” Lincoln reminded Douglas that the Kansas-Nebraska Act repealed the Missouri Compromise. Although Lincoln would lose his bid at senator, the Lincoln-Douglas debates put him in the national political headlights and he would become the Republican candidate for the presidential election of 1860. 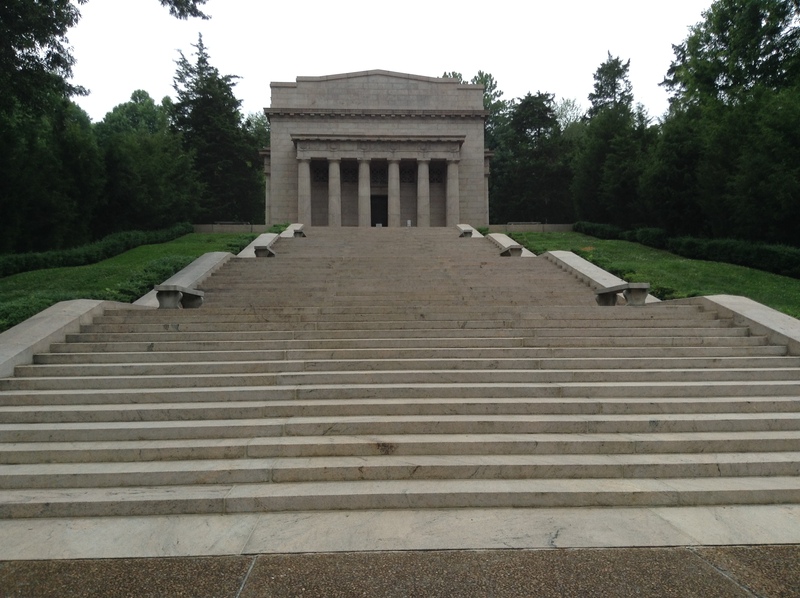 Visiting the Abraham Lincoln Birthplace National Historical Park in Hodgenville, Kentucky is a confusing experience. The longer I explore, the more questions I have. The short movie in the visitor center indicates Abraham Lincoln only lived in Kentucky the first seven years of his life. The ten minute film focuses on Abe’s parents, Nancy and Thomas Lincoln, and explains why Thomas and the Lincoln family moved from Sinking Spring Farm to Abraham’s boyhood home at Knob Creek two years later. So why is there an historical park in Kentucky honoring Abraham Lincoln when he only lived in Kentucky the first seven years of his life? Thomas and Nancy bought the 300 acre Sinking Spring Farm for $200 in December, 1808. Baby Abe was born February 12, 1809 in a tiny, one-room log cabin. A large, gaudy, pink granite and marble memorial building, eerily similar to the Lincoln memorial in Washington D.C., now stands, like a castle in a cornfield, near the site of the original log cabin. I walk up the 56 steps representing the 56 years of Abraham Lincoln’s life, open the massive door, and enter the Roman, neoclassical style structure. I feel like Alice passing through the rabbit hole. The marble and granite structure surrounds a modest, wooden structure. A simple, tiny, one-room log cabin is entombed inside the ornately carved memorial. I quickly learn from the informative volunteer that the cabin is not baby Abe’s birth cabin. It represents his birth cabin. Living on the Kentucky frontier meant long hours for daddy Thomas plowing the stony, red clay-packed soil, harvesting just enough corn to feed the small family and few animals, and tramping through the dense woods in search of game. Mommy Nancy spent her days caring for a toddler and an infant and preparing simple meals in a cast iron skillet over an open fireplace. I take a walk along the Boundary Oak Trail to view the sinking spring that is the namesake of the farm. Perhaps this fresh water spring hidden beneath American Chestnut trees is what drew the Lincoln’s to a simple, quiet, spare life on the frontier. A short walk from the garish memorial is the Nancy Lincoln Inn. I discover it is a store. And it has always been a store. The plaque outside says that the store and the four small cabins nearby were built in 1928 to honor Abe’s mother, Nancy Lincoln. Because Nancy only lived here for two years, the building was built to hold merchandise for sale, and the log cabins (in the style of baby Abe’s birth cabin) were constructed to accommodate paying guests, I suspect that the Nancy Lincoln Inn was built with the intention of making a profit. Nothing wrong with that. The 1920s saw a huge growth in the tourism industry. Why not grab the opportunity to sell lodging, candy, and cold beverages to people touring the Abraham Lincoln Birthplace Park? Cold beverage? Great idea! I purchase an ice cold, bottled, pure cane sugar Sarsaparillo and drive the ten miles to Knob Creek. Soon after moving to the farm, Thomas Lincoln was involved in a lawsuit disputing ownership of the land. In 1811, when little Abe was two years old, Thomas moved the Lincoln family ten miles to a 30 acre farm he leased on Knob Creek. 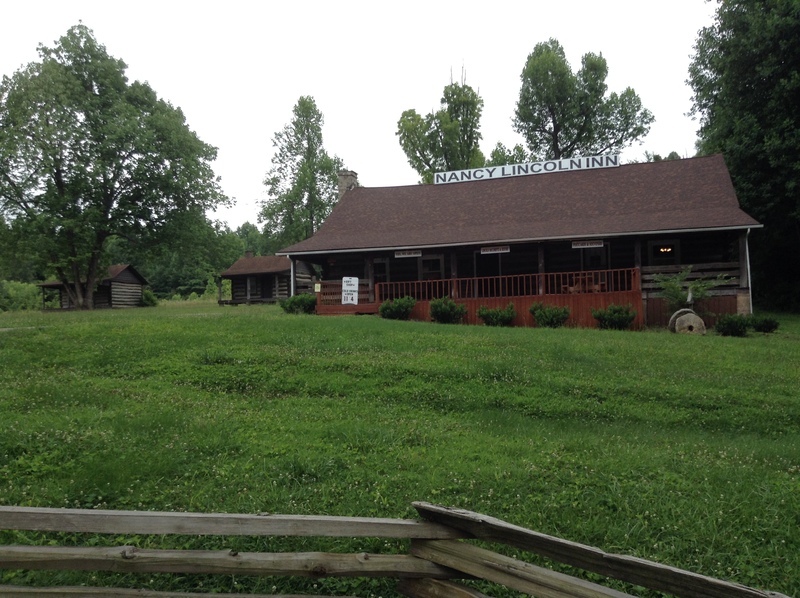 Abraham Lincoln’s earliest memories are at his boyhood home at Knob Creek. Abe and his sister, Sarah, walked two miles to a school that did not have books or writing utensils. Lessons were taught and learned by recitation. It was at this school, near Knob Creek, that Abraham Lincoln developed his love for learning and appreciation for education. Today Knob Creek still sits on the same road (although improved with asphalt and concrete) that young Abe may or may not have seen slaves being taken to market. 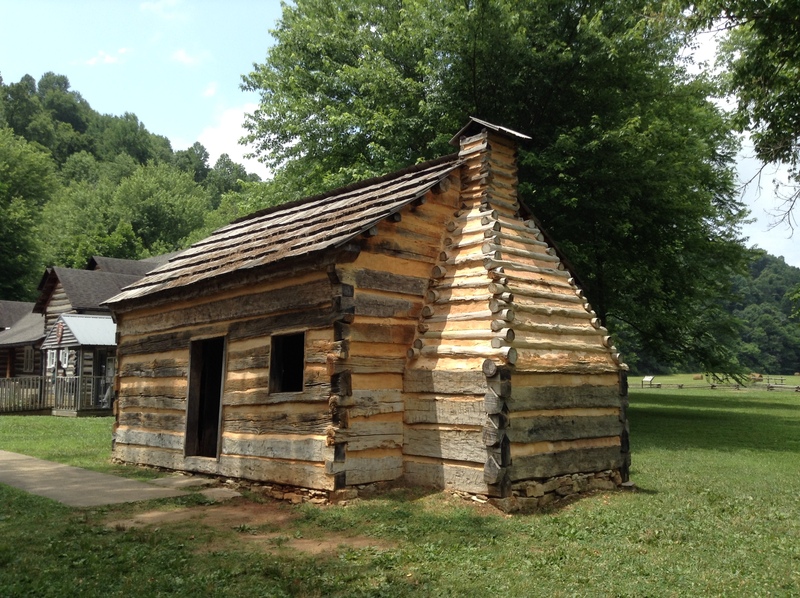 And yes, I tour the representative log cabin at Lincoln’s Boyhood Home at Knob Creek. In 1816, Thomas Lincoln lost his lawsuit to regain Sinking Springs Farm and moved his family, including seven-year-old Abe, to Illinois. 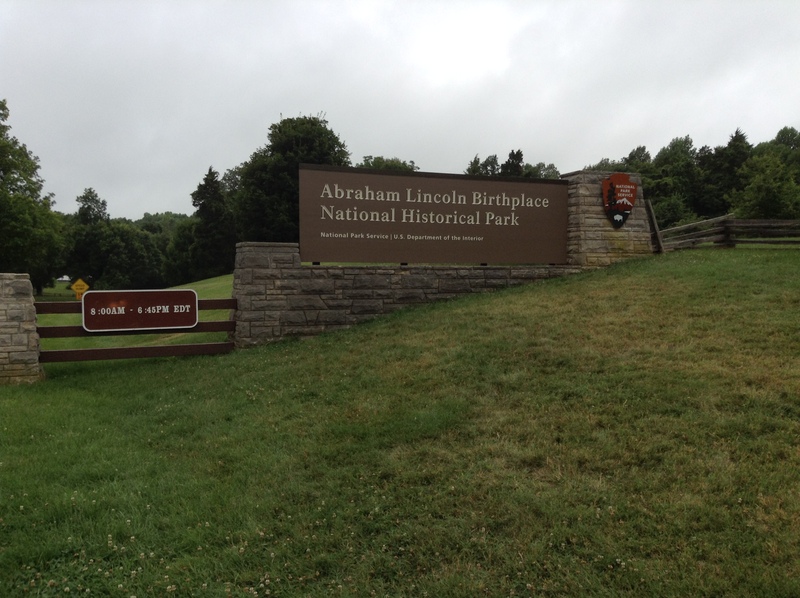 Partly because I love hiking and partly because I love history, my favorite experience at Abraham Lincoln Birthplace National Historical Park is walking the short Big Sink Trail. The Big Sink Trail is a .7 mile loop that meanders through the Kentucky woods of Abraham Lincoln’s early childhood. Very few visitors to the park take advantage of the well-maintained trail and it is easy to block out the sounds of nearby cars, the smells of nearby restaurants, and the sight of overhead airplanes. I can pretend, for half an hour, that I am a young Abe Lincoln, walking to school, hearing the sounds of birds twittering in the trees, smelling the wildflowers growing along the well-worn path, and seeing the leaves on the trees as they turn from green to red and drift slowly and gently to the ground. As I walk through the peaceful Kentucky woods, I ponder the purpose of the park. Abraham Lincoln is known to have said, “I cannot tell a lie”. (Not sure if that is fact or fiction. He was a politician!) However, the historical park honoring his birth borders on the edge of gray. Is this place, where Lincoln lived for only seven years, never to return to Kentucky, an accurate representation of Abe’s earliest years? To keep Abe honest, I focus on the symbolism of the park. Despite losing their farm, their home, and their livelihood, the Lincoln family persevered and, from these humble beginnings on the edge of the frontier, baby Abraham Lincoln eventually became the 16th president of the U.S. Born in a modest, one-room log cabin, Lincoln died while living in the White House. The simple cabin enshrined in an ornate memorial stands as a symbol of what all Americans can achieve with the basic core values of hard work, determination, and perseverance.